A blog was started on ArtFair Insiders about Romance at Art Shows. 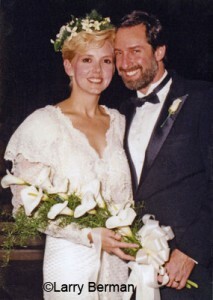 Reminded me that last month was 25 years since I met my wife at the Three Rivers Art Festival in Pittsburgh in June 1987. That’s when I was selling teddy bear photographs and she thought that anyone that could take pictures like that would be a fun person to be with. She actually purchased a photograph from me just so she could give me a check with her phone number on it. She later got cold feet and sent a friend back to return the photo. I told her friend she would have to come back herself to pick up the check. That evening was the first time we went out. We met in June and were married four months later and have been happy together ever since. Ginny Herzog was at our house a few years ago and when she saw this photo, she asked if they were our children. Nope, that was us in a past life.